FULTON, NY – Lions Club International will team up with CNY Arts Center to sponsor the May 4 performance of Helen Keller, a new stage adaptation of the classic story. The play opens April 26 at 8 p.m. and runs through May 5 at CNY Arts Center located in the State Street Methodist Church. Annie finger-spells into Helen’s hand in this scene from Helen Keller, a new adaptation of the classic story. Annie is played by Taylor Hamer, and Helen is portrayed by Sophie Greene. Born in Tuscumbia, Alabama, in 1880, Helen Keller developed a fever at 18 months of age that left her blind and deaf. With the help of an exceptional teacher, Anne Mansfield Sullivan of the Perkins School for the Blind, Helen learned sign language and braille. A few years later, she learned to speak. As an adult she became a tireless advocate for people with disabilities. In a speech delivered June 30, 1925, at the International Convention in Cedar Point, Ohio, Keller sought help for the American Foundation for the Blind, in its infancy at the time. “I suppose you have heard the legend that represents opportunity as a capricious lady, who knocks at every door but once, and if the door isn’t opened quickly, she passes on, never to return. And that is as it should be…I am your opportunity. I am knocking at your door. I want to be adopted. The legend doesn’t say what you are to do when several beautiful opportunities present themselves at the same door. I guess you have to choose the one you love best. I hope you will adopt me. I am the youngest here, and what I offer you is full of splendid opportunities for service,” she said. Her plaintive appeal asked the members to pretend what it felt like to be blind. “Picture yourself stumbling and groping at noonday as in the night; your work, your independence, gone. In that dark world wouldn’t you be glad if a friend took you by the hand and said, ‘Come with me and I will teach you how to do some of the things you used to do when you could see?’ That is just the kind of friend the American Foundation is going to be to all the blind in this country if seeing people will give it the support it must have,” she said. Keller challenged the Lions to foster and sponsor the work of the American Foundation for the Blind. “Will you not help me hasten the day when there shall be no preventable blindness; no little deaf, blind child untaught; no blind man or woman unaided? I appeal to you Lions, you who have your sight, your hearing, you who are strong and brave and kind. Will you not constitute yourselves Knights of the Blind in this crusade against darkness?” she said. The Lions accepted her challenge and their work ever since has included sight programs aimed at preventable blindness. “For nearly 100 years, our members have worked on projects designed to prevent blindness, restore eyesight and improve eye health and eye care for hundreds of millions of people worldwide…Through efforts such as these, Lions have gained worldwide recognition for our work to improve sight and prevent blindness.” This quote taken from www.lionsclub.org champions the commitment to Keller’s challenge in efforts that include recycling eyeglasses; supporting Lions Eye Banks that provide eye tissue for sight-saving surgeries; vision screening for hundreds of thousands of people every year, and blindness prevention by providing treatment to those at risk of losing their vision. Those efforts will now sponsor a performance of the new Keller production, CNY Arts Center’s third mainstage production since moving into its new facility located in State Street Methodist Church, 357 State St. Please use the Park Street entrance. Eyeglass collection boxes will be available at the May 4 performance along with information about the Lions Club International and all the philanthropic work the group does. 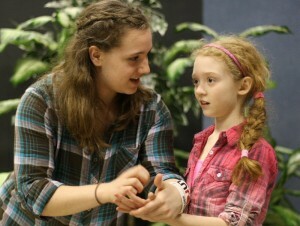 Helen Keller opens April 26 at 8 p.m. and continues April 27, May 3 and 4 at 8 p.m., with Sunday matinees April 28 and May 5 at 2 p.m.
For more information about the production visit www.CNYArtsCenter.com or call 592-3373.